This book is a perfect example of what I love about the New Adult Genre, a fun, easy to read story, characters the reader can love ( and hate) and some solid drama. Maddie, oh Maddie, has has the hots for her good friend Kyle’s big brother Jared for ages. Maddie’s the good girl, works hard, and has a steady music career lined up. Secretly though she loves her guitar, and has dreams of a rock star life. That’s all fine until Jared’s band is in need of a new member very quickly, as their Bassist has left after Jared did his usual thing, had a one night stand and she wanted more. Hector and Kyle are furious with him, he’s hit too close to home this time and they’re in danger of being unable to audition for the reality show The Sound. Maddie is looking round the new studio at Kyle’s invite, and can’t resist picking up Jared’s guitar and playing. No-one is around to hear her so she lets rips, gives it everything and then is shocked to find Jared is there. Of course next day the problem with the bassist crops up and Jared suggests Maddie. Kyle isn’t happy – there’s a reason he’s kept Maddie away from Jared for the past three years, and now they will be very close, but they’ve no time to find someone else with the audition being so close. It’s persuade Maddie or drop out and try next year. Well, its a great fun read, with a great description of their TV experiences and the competition. Its not all smooth sailing, more a rough, stormy ride and I loved the way their first experiences were so tough, with the promised help not happening. Then there’s Lacey, one of the other contestants who’s clearly out for revenge after Jared turned her down and she blames Maddie…I love that b itchy stuff, and lots of jealousy. 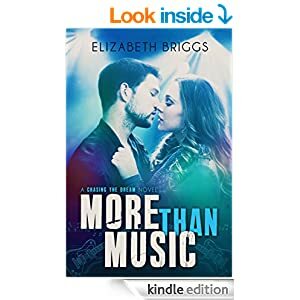 Maddie and Jared find each other too attractive to live up to their promises, but for the band and for the show they have to hide their feelings….Secrets – we know what happens with them though don’t we, they always sneak out at just the wrong moment. There’s also a tie in to Maddie’s background that makes this part interesting, and adds to the feeling of reality about what eventually happened. I really enjoyed the story, I felt as if I was there with the band, and they were such a good bunch I wanted things to go well for them. I liked knowing more about the other bands too, and seeing how motivation can make people do things they wouldn’t usually do. Its not just a bland romance but one full of problems and pitfalls, happiness and heartbreak, drama and despair. As well as rooting for Maddie and Jared I was rooting for the band’s success on the show too. Its a decent length at just over 300 pages and that lets the plots and characters be fully expanded, and gives me the feeling I understand them and what’s happening. Its a read I really enjoyed and I’m looking forward to more from the series. Stars: Five, its a great solid read, good fun, though one I’m unlikely to re read. ARC supplied by Netgalley and publisher.